Continuing on the .Net Core series, on this post, let's talk about building web applications using the .Net Core framework entirely on Linux. But before touching code, what is Asp.Net Core? 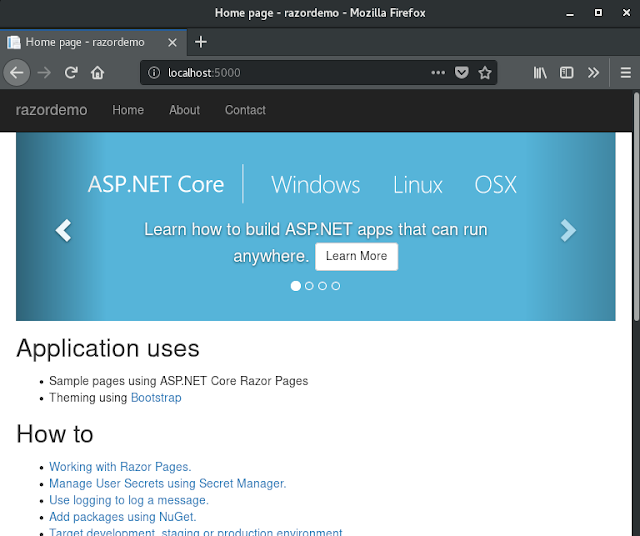 Asp.Net Core is the evolution of Asp.Net, a web application framework developed by Microsoft to build web applications Apis and web services. Asp.Net Core was supposed to be ASP.NET v5 but since it's a full rewrite and was based on .Net Core Framework (and not on the .Net Framework), it was renamed to ASP.NET Core to mark as not being part of the ASP.NET framework. (For a gentle introduction on Asp.Net Core, please visit this page). Because it represents the next generation of the existing Asp.Net stack with true multi-platform, faster and with many other improvements.I will not list here what I found is a substantial change between Asp.Net and Asp.Net Core. 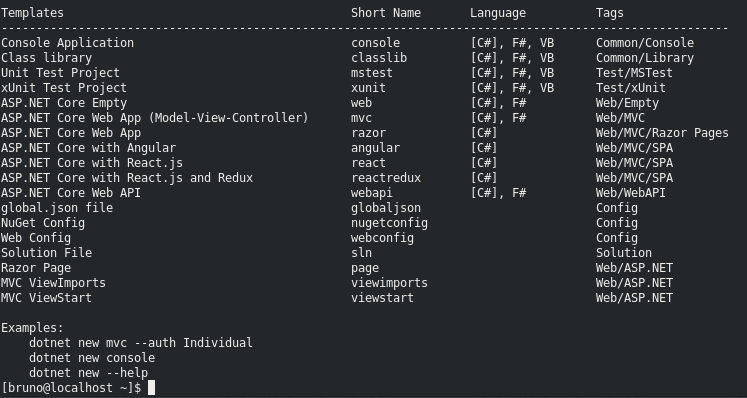 making web app deployments as easy as deploying a console app. .NET Core is compatible with .NET Framework making it adhere to the already existing .Net standard base, being compatible with Xamarin and Mono, via the .NET Standard. So let's review two common use cases: creating a razor based asp.net core web app and an Agular .Net Core web app. 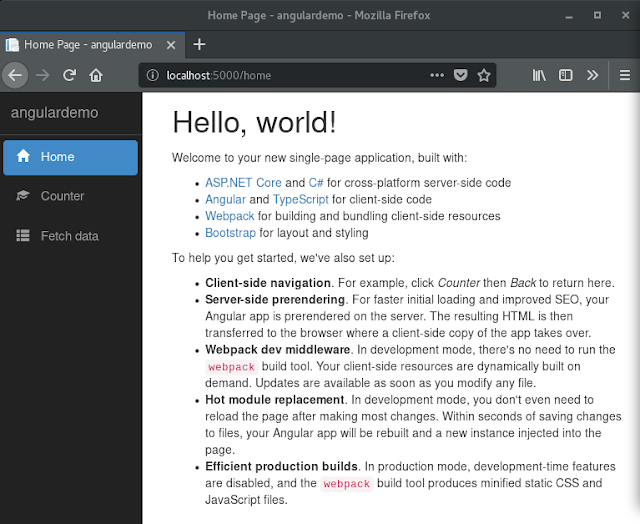 In order to create SPA web apps in .Net Core, we may need to install the Microsoft.AspNetCore.SpaTemplates nuget package. That package installs spa templates for the more common client side frameworks including Angular and React.js. On this post we introduced Asp.Net Core development on Linux. 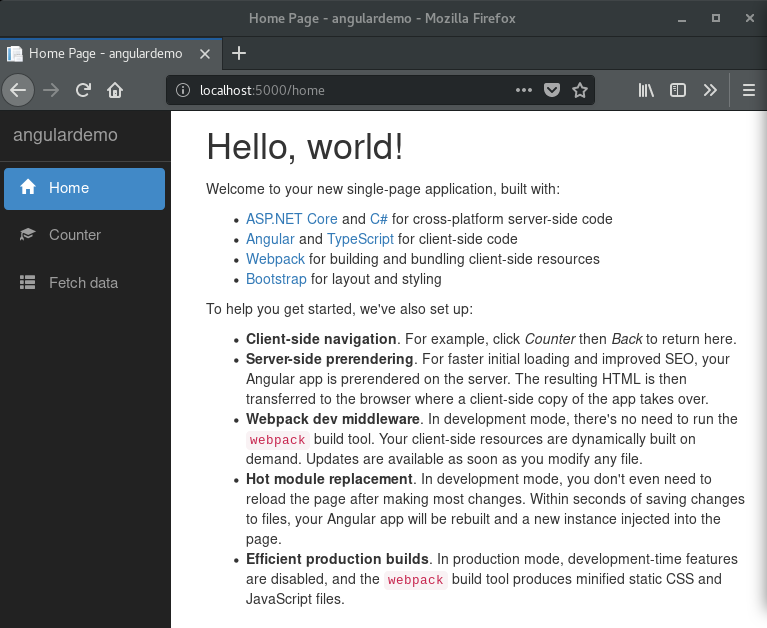 I wanted to demo how easy it was to scaffold Asp.Net Core web apps entirely in Linux to show how mature .Net Core has gotten on non-Windows platforms. You can reproduce the exact same steps on your Mac if you want. I will continue exploring .Net Core on this blog especially because there's a huge opportunity for developers from both the .Net and the Linux communities to grow, share and work together. And remember: Linux is now a viable alternative for developers working with the .Net stack! Why don't you also give it a try yourself? For more .Net Core series on this blog, click here.